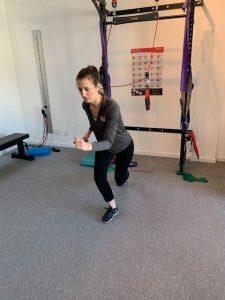 Exercises to get you ready for Ski Season!!! 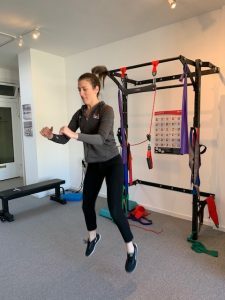 Whether you’re a novice skier or you frequent the slopes, it’s important to be in the right condition once ski season hits. 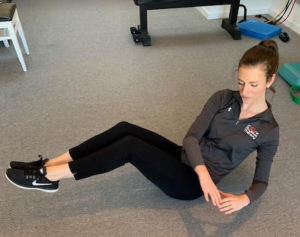 Follow these tips to help maximize your performance and prevent injury. Most skiers spend at least 4-6 hours on the slopes per day. Cardiovascular endurance and muscular endurance will be important to minimize fatigue after sitting spending the week seated at your desk. We recommend 30-60 min of cardio conditioning at least 3-4 days/week. 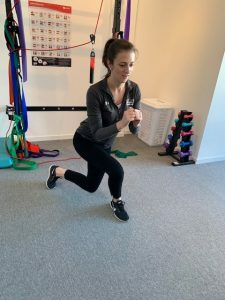 These four exercises can help improve strength and control while downhill skiing. Our recommendation: perform a full set with a 30 second rest break between, and repeat 3 times. Squats: Keeping your feet shoulder width apart, bend your knees as you lower to the floor. Be sure you can still see your toes, and keep your weight primarily in your heels. Repeat 15 times. 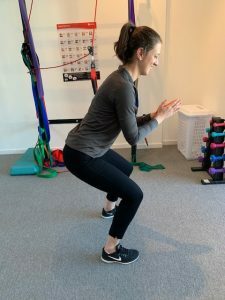 Curtsy Lunge: Start in an upright position, cross your right leg over your left, placing most of your weight through the right side before pushing back up to stand. Alternate sides to complete 1 repetition. Repeat 15 times. Skaters: Start in a partial squat, taking a large jump from side to side. Focus on controlled deceleration before leaping to opposite side. Perform for 30 seconds. Jump Squats: From a squat position, explode upward lifting feet off the ground and knees towards your chest. Perform 5-10 repetitions. 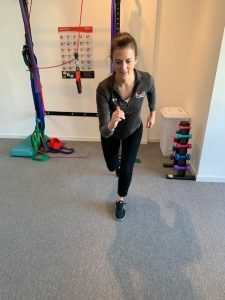 It’s important to maintain good trunk stability while skiing all day these exercises can help engage your core while adjusting to various terrain you might meet on the slopes. 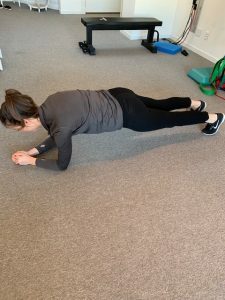 Plank Hold: Perform 3 sets of 30-60 seconds.Russian Twists: In a crunch position, using a weighted medicine ball, tap the ball on either side of your trunk with controlled movements. Perform 3 sets of 30-60 seconds. Russian Twists: In a crunch position, using a weighted medicine ball, tap the ball on either side of your trunk with controlled movements. Perform 3 sets of 30-60 seconds. Don’t consider the walk from your car to the bottom of the slope your warm up. Try a series of dynamic stretches to help prepare joints and muscles for optimal activation. If you’re on a time crunch try these 3 exercise: knee to chest, foot grab and trunk rotation.